I am really excited about this, everyone. REALLY excited. This Sunday at the Downtown Alamo Ritz, STAG Comedy will take the stage for a mix of live and video sketches. 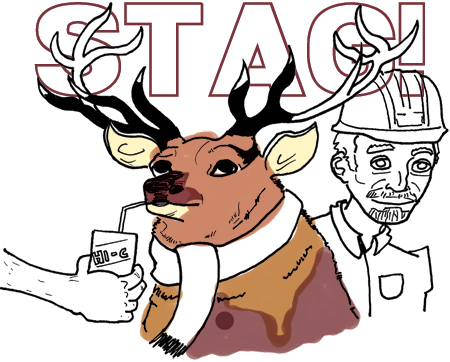 STAG! is comprised of Joe Parsons, Ben Bartley, Scott Chester (Master Pancake Theater, Comedy Sportz), and all of us kids in Mascot Wedding. We’ve been working on this show all summer and we think it’s going to be a blast. I’d tell you more about the kind of stuff you’re going to see but I don’t want to spoil anything. This show is one-time only! So come downtown to the Alamo Drafthouse, this Sunday, September 13th. Show starts at 7:10 PM. Tix here. Next Next post: Last KOOP Membership Drive show for Mascot Wedding Today!